This event sponsorship agreement sets out the commercial deal between an event organiser and a sponsor. It also provides for practical arrangements,such as rights of access prior to the event for the sponsor to setup their materials, use of intellectual property by the sponsor in marketing, dedicated parking on the day for the sponsor's guests and provision of corporate hospitality areas. This agreement is very flexible in the terms between the parties. We suggest common rights to be granted to the sponsor, such as advertising, product placement and preferential event access, hosting of corporate hospitality functions, and promotion on television or radio. These suggestions can be replaced or supplemented by those rights that you decide upon. The agreement also covers a number of practical considerations, such as the obligation of the organiser to ensure that the sponsor is able to setup advertising and stalls and has access to parking on the day. The law in this document is common law, allowing you to set out whatever arrangement you choose to make. It includes a number of legal matters to the advantage of both sides that might be left out of less comprehensive agreements, such as protection of intellectual property, assignment and rights to renew. 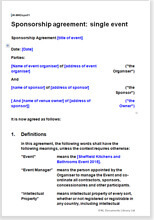 This event sponsorship agreement could be used for a diverse range of one-off events, from a single sports competition, where the sponsor receives advertising rights and a corporate hospitality suite in return for financial support, to a home improvements exhibition, where the sponsor receives additional or alternative rights such as the right to sell products from a stand or the right to advertise their status as a sponsor of the event on marketing material. This document could be used by either the organiser or the sponsor, potentially at first to explore the deal that could be made, and then as the legal contract. Either party could use it to set out their terms and conditions on a "take it or leave it" basis, or as a starting point for negotiations. We have another agreement that may be more suitable if the sponsor is sponsoring multiple events or a series (for example, a tournament or a tour of shows to different locations). See Event sponsorship agreement: tournament, league or series. "...Yes very useful. I understand the terminology etc as I've seen a fair few legal docs before. Notes are very helpful. Gives me some base insight without the expense of a solicitor!"